Here we have another high value, high demand comic from the Silver Age. 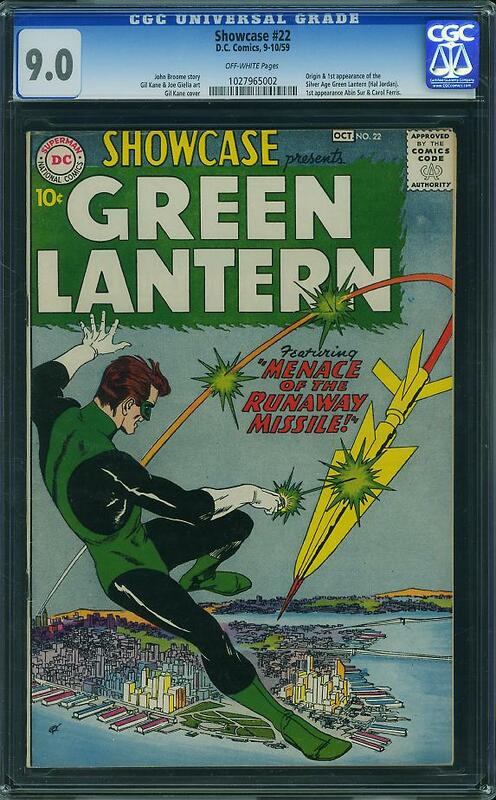 Showcase #22 is the first appearance of Hal Jordan and tells the tale of how he became the Green Lantern. In the short six page story "S.O.S. Green Lantern! ", test pilot extraordinaire Hal Jordan is summoned by the alien Abin Sur after his space craft crashes in the middle of nowhere. As Abin Sur, also a Green Lantern, lay dying, he explains to Hal how and why he was summoned there. Abin Sur tells him that the energy from the Power Ring he's wearing sought out someone who is "fearless and honest" to take his place as a Green Lantern. 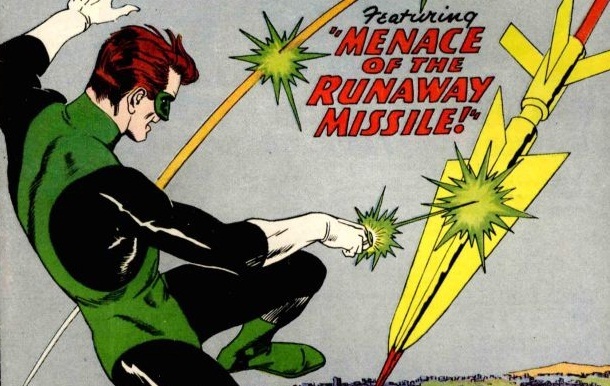 He gives Hal the ring and the Battery of Power and presto chango, Hal Jordan is now the new Green Lantern. The Battery of Power is the lantern that charges a Lantern's Power Ring. On a side note, it's also explained why the Green Lanterns are powerless against the color yellow. If you don't already know, you can click here to read the story and find out for yourself. In the next story "Secret of the Flaming Spear", we are introduced to Carol Ferris and her father Carl Ferris. We won't concern ourselves too much with Carl, but Carol is the on and off again love interest of Hal Jordan. Later, in Green Lantern #16, she becomes Star Sapphire, but let's not get too far ahead of ourselves here. That's a story for another time. There aren't very many high grade copies of Showcase #22 out in the world, so, if you're looking for one, you're really going to have to hunt for it. The CGC census only lists 22 out of 699 copies graded at an 8.0 or higher, with seven of the 22 being Restored copies. There is a nice Universal 9.2 copy listed on the census, but I couldn't find any sales data for it. However, a 9.0 sold at Heritage Auctions in 2006 for $15,535. This sale is a little outdated. Ten years is quite a long time ago. In the 45th edition of the Overstreet Comic Book Price Guide, 9.0 copies are listed at $21,000. I have a feeling that number is low too. With the comic boom that we are in now, and the popularity of this comic, I'm sure it would sell for much more than that. If we look at the more recent sales prices for lower grade copies, I'm sure you'll agree with me. According to GoCollect, the highest grade sale on eBay over the last two years has been a mid grade 6.5 Fine+. A copy at this grade sold for $5,250 a little more than a year ago. Even lower grade 2.0 - 3.0 copies are jumping past the $1,000 mark right now. As the high and mid grade copies continue to rise in price, you'll see a bigger demand for the more "affordable" low grade copies. I use the word affordable loosely. As you can see from the chart, ultra low grade 0.5 - 1.5 copy sales have increased in price by an average of about 40% over the last two years. Whether this will continue or not, I don't know, but for now, the demand is there and sales are going strong. If it fits into your budget, now may be the time to invest in a copy of this super key issue for yourself. This one slipped through my fingers. I didn't act fast enough to get me a copy when they were still pretty cheap for a Silver Age DC key issue. Still haunts me to this day. Damn it! I was thinking about that as I was writing this. Don't give up though, you might still find a deal somewhere....maybe. I appreciate the offer, but I've shifted my collecting to more Golden Age books. If I change my mind, I'll be sure to shoot you an email.